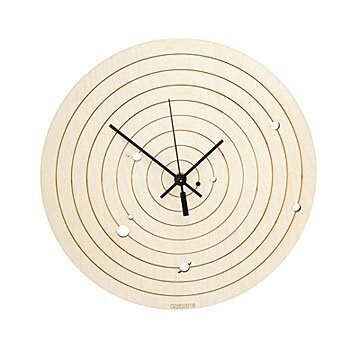 This custom clock shows the position the planets were in on the special date of your choice. Sometimes, the planets align. And sometimes, something magical happens when they do: two people fall in love, a baby's born. Mike Jensen's custom clock keeps that special date on display. The position the planets were in that day is laser cut into the design, creating a gift they'll love to infinity and beyond. Designed and made from CARB-certified Baltic birch plywood in Charlottesville, Virginia. Originally from Maine, Mike Jensen relocated to Virginia to escape the cold of the Northeast. As a kid, he assisted his father in building a number of wooden boats, so Mike particularly enjoys designs that are both technical and artistic. When he's not designing, Mike enjoys exploring the twisting back roads of central Virginia in his vintage convertible (he's also into automotive restoration) or sampling the variety of local craft beers. Wipe with dry cloth. Apply light mineral oil if wood dries out. Bamboo is flammable. Keep away from open flames and hot lights. Double AA battery required.